Gernerally, we don't advise driving in Barcelona by car. It is chaotic and difficult for Non-Spanish people standards and parking spaces are rare and expensive. Alternatively, you have a very well-developed public transport with busses and subways which easily take you to all places of interest. The Barcelona Card offers free use of public transport in combination with free admissions to many attractions. Simply enter the desired number of Barcelona Cards, Bus Turístic tickets or Hola BCN tickets and choose the shipping option. You can choose between shipping via post or e-mail (voucher). You will receive the discounts included in the Barcelona Card directly at the respective ticket offices. At sights with skip the line you can just enter the sight. Full flexibility: You can decide yourself when you would like to start using the Barcelona Cards and the tickets in the respective validity year. You do not have to commit yourself to a specific date at booking. The beginning of validity is the first use of the card or tickets. The Barcelona Card and Hola BCN tickets are then valid for 72, 96 and 120 hours, respectively. Fast mailing (4.90 € shipping costs): This allows you to hold your Barcelona Cards, Hola BCN tickets or Bus Turístic tickets in your hands before you travel. No waiting at pickup location required, no detours. You are independent of the opening hours of the issuing offices. Shipping time to Germany is only 1-2 business days, to Austria 2-4 business days and to Switzerland 2-6 business days. Here you will find an overview of the delivery times. Sending by e-mail (free shipping): Immediately after booking, you will receive a voucher that allows you to pick up your booked Barcelona Cards, Hola BCN tickets or Bus Turístic tickets directly at the airport or at various points in the city (for delivery points see below). E-mailing of vouchers will be done directly after booking. Central Station Sants Estació (daily 08:00 - 20:00, on 26 December and 6 of January: from 9:00 - 15:00). Booking without risk: You can return unused Barcelona Cards, Hola BCN and Bus Turístic tickets shipped from us by post until 15.01. of the following year. The tickets have to be in a resalable condition. You will receive a full refund. If you have booked the shipment by e-mail voucher, you can cancel the booking up to six weeks after the booking, but not later than 15.01. of the following year. On numerous public parking garages and parking lots you have the opportunity to park your mobile pedestal. Parking spots directly at the sights are rare and often busy. On top of that your vehicle will be towed even in the case of minor parking violations. The largest parking garage operator is the urban B:SM (Barcelona de Serveis Municipals), which operates more than 50 parking garages and parking spaces with more than 14,000 seats for cars, motorcycles, buses and RVs. The car parks of the B:SM are usually very modern and extensively equipped, e.g. with lockers, toilets (also handicapped accessible), parking for disabled, charging stations for e-cars and electric motorcycles and security. They are a bit more generous so that you can get around the corners even with larger cars. Here you will find an overview of the parking garages. The main provider of online parking reservation is Parclick with 220 parking garages in Barcelona. At Parclick, you can conveniently book your parking space in parking garages online, sometimes even cheaper as if you by them at the parking garage. So you have a guaranteed parking when you arrive. Here you can book your parking space online and compare prices. On the Parclick page, select the parking space and the date you wish to arrive. Before booking, please pay attention to the specific features of each parking garage (open 24 hours, disabled parking, monitoring, fixed parking slot, etc.). After the online payment, you will receive a voucher by e-mail with your booking code. You do not need to print the E-Mail and also can use the Parclick App. On the day and, if applicable time of your reserved parking space, enter the car park as usual and drag a parking ticket at the entrance gate. In the car park, you have either been assigned a specific parking space in advance or you can park on any free parking slot. You will find this on your booking reservation. After parking your vehicle take the Parclick voucher and the park ticket pulled at the counter and go to the gatekeeper / supervisor in the Ticket Booth or Control Booth. The staff uses the booking code to check your reservation and then gives you a card. With multiparking you even get multiple entries and exits. If there is no staff in the surveillance booth, do not worry: Use the intercom located at the ATM or at the exit barrier to contact the Remote Service Centre and follow the same process described above. Should you no longer need the car park, you can cancel it free of charge depending on the parking garage until 11:59 pm on the previous day or up to a few hours before you reservation. For privately operated parking garages and hotel car parks in the city centre you have to expect € 15-30 per day. Many of the parking garages are quite small and winding, with a big car it might be tight. The equipment is not as extensive as in the urban parking facilities of the B:SM, but the price is often a bit cheaper. The prices in the urban parking garages of the B:SM and private providers vary from day to day: there are weekend prices, day and night prices and various offers. The parking price starts at about € 3.15 per hour, the daily rate between € 30 and € 35. Parclick: At Parclick you can also buy monthly tickets and comparing prices online you can receive up to 70% discount. Parking Card: the Parking Card is available for 1, 3, 5 and 7 days or 24, 72, 120 and 168 hours. The time is coherent and you can use with the map the participating parking garages of the B:SM. A change of the parking garage within the booked time is possible. The prices are € 20, € 35, € 49 and € 62, no matter how often you use the park or underground car park. Hourly Card: here you can book 25, 50 or 100 hours of parking in advance. Only the actual parking time will be billed to the minute. These parking tickets cost € 57.12, € 108.69 and € 198.83, respectively. Bonus Card: With this card you can park as often as you like in a parking garage of your choice. The bonus card is available for one day (€ 15) and for 15 days (€ 70). 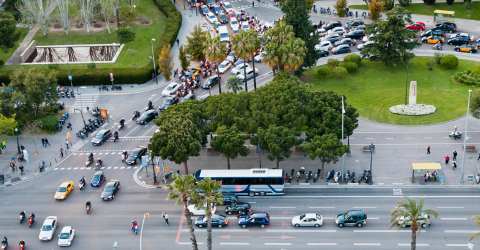 If you would like to come to Barcelona by motorhome, you will find the Garcia Fària-Diagonal Mar Car Park at Ps. García Faria, 71, near Fòrum. A reservation is recommended. From here you can easily reach the city centre with the metro L4 or the Bus Turístic (summer). Close campsites are located north or south of the city. Just drive along the coastal road to the next campsite. Barcelona itself has none. Bus Garcia Fària-Diagonal Mar, at the northern outskirt of the city at Ps. García Faria, 71. It costs € 5,20 per hour, the whole night is €20,95. The maximum hight is 4.50 metres. Parking Bus Moll d'Espanya, in the centre of Barcelona. Prices are the same as at Bus Garcia Fària-Diagonal Mar (see above). All B:SM car parks have parking spaces with charging stations for e-cars and electric motorcycles. Spread within the city there are charging stations located on the streets. Again, if you park in such a reserved parking space without loading your vehicle, you will be towed fast. Public disabled parking, green and blue parking spaces and loading and unloading zones can be used free of charge (badge must be clearly visible). However, restrictions apply regarding the maximum permissible parking time, which is signposted. There are disabled parking spaces at most public parking garages of the B:SM, but these are charged with the regular tariffs. Car parks operated by private providers often have a disabled parking space, which also cost a fee. Many hotels in Barcelona offer their own private parking or underground parking. The prices range from € 15,00-30,00 per day. Some hotels use public parking nearby. Just check at each hotel description under the heading "Parking". For an overview of hotels with parking spaces, check the "Parking" option in our hotel search. Basically, the same traffic rules apply in Barcelona as they apply in the rest of Spain and Europe. But you should consider a few things. If you are not used to driving in a southern city, it is an adventure in Barcelona too! We recommend parking the car in a parking garage, parking lot or a hotel underground car park and exploring the city with the well-developed public transport. Without a car you are very mobile in Barcelona. Incorrect parking should be avoided at all costs. Yellow stripes on the roadside are to be avoided as parking strictly. In Spain, the penalties for traffic violations are very high - even for Central European conditions - and in Barcelona you get towed very fast. At the point where your car stood, a red sticker sticks on the street with the location where your car is stored. Never park on a disabled parking space or other reserved spots without an appropriate authorization, not even "just for 5 minutes". On the one hand, doing so is antisocial, on the other it is expensive and you can then pick up your vehicle at the urban storage station. Within the city, the speed limit for cars and motorcycles is 50 km/h, on country roads 90 km/h, on highways 100 km/h and on the freeway 120 km/h. Cars with caravans or trailers up to 0.75 tons are allowed to drive on rural roads and highways at 80 km/h and on freeways 90 km/h. Cars with caravans or trailers heavier than 0.75 tons are only allowed to drive at 80 km/h on freeways. Motorhomes up to 3.5 tons are allowed to drive 50 km/h in the city, 80 km/h on country roads, 90 km/h on highways and 100 km/h on freeways. Motorhomes with more than 3.5 tons are allowed to drive only 80 km/h on highways and 90 km/h on freeways. The permitted limit for alcohol in the blood is a BAC of 0.05. For novice drivers, whose license is less than 2 years old, it is a BAC of 0.03. But here too, if you drive strikingly or even cause an accident, a lower limit applies. Towing with private cars is prohibited. Any person outdoors that has a breakdown outside closed areas on the road must wear a reflective safety vest. This plus in security is available in every hardware store and in many supermarkets for about € 1.50 to € 3.50. In case of an accident always inform the police. The general emergency number is 112. In-car calls are only allowed with hands-free equipment. Headsets etc. are not allowed. Penalties range from € 90 to € 300. What do you need to have in the car? When driving the car you always need to have your driver's license, the vehicle registration certificate and the green insurance card with you, that your insurance company issues to you. Also mandatory are spare bulbs and two warning triangles, so you can warn the oncoming traffic as well. Of course, a first aid kit must be available in every vehicle. For every passenger, you should also have a safety vest handy in your car. Children up to the age of 10 may only be taken in the back seat and a suitable child seat must be available up to a height of 1.50 metres. The fines are very high for Central European conditions, especially for alcohol and speeding violations. Even lower speed violations can cost quite a few hundred euros. It is a rumor that the police in Spain and Barcelona are quite casual in laying down the rules and are lenient when it comes to traffic violations. The opposite is the case: the rules are strictly applied and there is no room for negotiation! Foreigners need to pay the fines immediately to the police. They will give you a receipt. Even minor traffic violations such as wrong parking can be expensive, and cars are towed quite quickly. The city council of Barcelona has its own fleet of tow trucks. The EU-wide uniform enforcement assistance agreement fights € 70 across Europe. The former practice of simply not paying traffic tickets from abroad does not work anymore. Book free use of public transport and many other discounts. Admission without standing in line. Get on and off of over 40 stations and enjoy the sun. Please, enter the desired number of Bus Turístic Tickets and get the online discount. For 48, 72, 96 or 120 hours free use of public transport. A very special "service" the B:SM offer you, if you park your car in the parking ban or even in a disabled parking lot: it will simply be towed. This happens fast and will be very expensive for the driver. A sticker on the floor where your car used to stand tells you where you can pick up your vehicle. You can also look that up on the website of the B:SM. Best would be to leave your car at home. Here you can find a list of all Car Parking with prices. Private transfer from the airport or harbour will make it easier for you, especially with luggage. Trip to the Montserrat on your own. Ticket package for metro, train, cable car or rack railway.